It seems like the natural progression after choosing a safe to store your guns and valuables is trying to figure out where to place it. 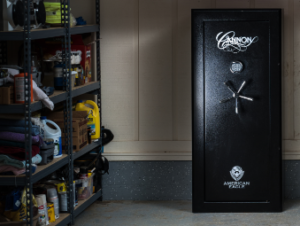 Various conditions should be considered when evaluating the location of the safe for maximized convenience and efficiency. Protection from theft, flood, and fire should all be taken into consideration and must be assessed by the level of risk and personal importance. First, take into account what you will store in the safe. This will begin to prioritize the natural flow of arrangement. If you are in need of storing goods that will require constant retrieval then a close proximity to the area they will be used is ideal. For example, storing family heirlooms, jewelry, and currency will be most secure in areas like a bedroom, bathroom or closet. These areas are also idea for gun storage as well. 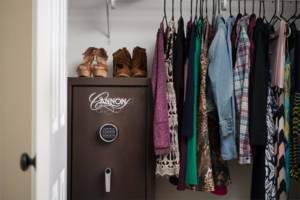 Choosing a location for your safe to store less frequented items that will tend to be tucked away for an extended amount of time will be a less demanding task. In this case, a spare closet, garage, basement or office could be viable options. Humidity and temperature control should be examined for certain circumstances. For example, helping to keep your firearm collection free from rusting in a less humid environment is critical for keeping your weapons in top condition. In this case, dehumidifiers are a great addition for aiding in proper climate levels. In combination to this, choosing to keep your safe in a cooler indoor atmosphere is best practice. Lastly, physical weight is also a supplementary factor. Safes weighing less than 1,000 lbs. 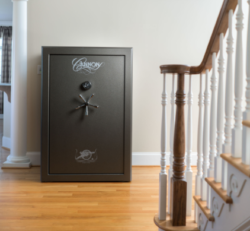 are okay for upstairs storage while safes over 1,000 lbs. are best kept on ground floors. 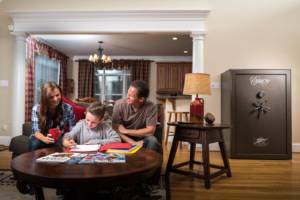 Take a look at this easy to read chart that provides more detail on things to consider when deciding where to place your new safe. Want more useful information? Sign up here.